KoopaTV: Is Yoshi's Crafted World a Must-Buy? By LUDWIG VON KOOPA - I'm making a lot of these “Such and such is out now!” articles lately. Switch getting a lot of games? That said, no one in the comments section asked about gameplay. Perhaps it's because it's the same gameplay in every Yoshi game. Exploration-based (for collectible purposes) platforming that sometimes involves babies and sometimes doesn't. Kamek and/or Lord Bowser (as an infant) are always involved. They usually have unique and appreciable art styles, or they're made by Artoon or Arzest and are horrible games. The graphics style is unique (but so what? I don't see amiibo for it like Yoshi's Woolly World) and so is the playing the stage backwards part. Unique at least for Yoshi games. Good-Feel, the game developer, previously worked on Wario Land: Shake It! which had a similar gimmick, albeit it was the same stage playthrough—once you get to the end, you have speed-run back to the beginning. Sometimes taking a different route than the one you originally took. In Yoshi's Crafted World, playing the stage backwards is on a separate runthrough. I've been hearing a lot that the soundtrack for Yoshi's Crafted World is very mediocre, and not on-par for Good-Feel. 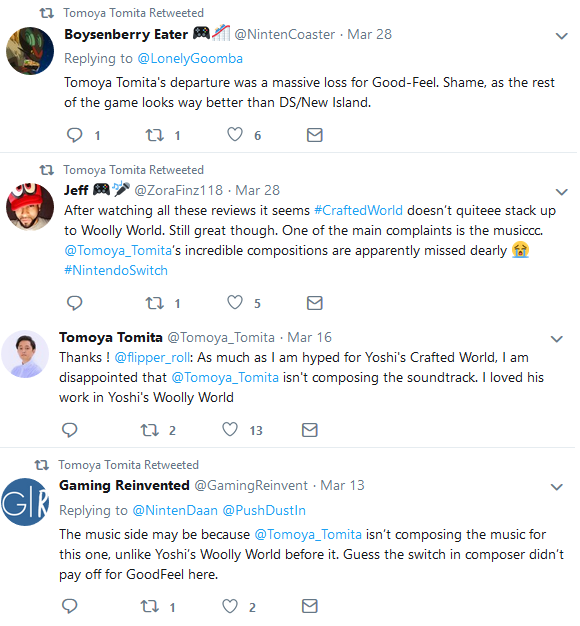 Apparently, the Good-Feel musician who composed their previous games, Tomoya Tomita, quit Good-Feel after Woolly World and he's been retweeting people bashing Crafted World's soundtrack. Seems a bit unprofessional to me. I wonder if he's just searching for references to his name on Twitter. The soundtrack to Yoshi games is always the weakest, or the least strong, part of the game. Even for Yoshi's Island and Woolly World, though I will say that Woolly World soundtrack is the strongest for a Yoshi game. In conclusion, Yoshi's Crafted World has exactly the kind of gameplay I like and want, as an exploration platformer fan who seeks to 100% games. But I won't buy it yet. Maybe it'll eventually be discounted like Yoshi's Woolly World is. I know waiting won't make the game improve, but I lack a burning desire to have to play it now. I'm sure it's solid, just not amazingly so. Though the demo did impress me with how much KoopaTV philosophy it addressed. Here's the link about the Yoshi's Crafted World demo again, with commentary on trains and cows. Some important context for this article is that Ludwig thinks that Yoshi's Island is the best platformer ever made, and Yoshi's Woolly World is of comparable quality to it. If Ludwig should reprioritise his gaming outlook to put Yoshi's Crafted World as something of critical importance, let him know in the comments section. Between this game and Kirby: Star Allies, I would have to choose the latter as my pick as the best feel-good platformer on the Switch. While it did not have much content at launch, Kirby: Star Allies quickly received enough extra content through free DLC to convince me that it is a complete game and worth the price. Yoshi's Crafted World, however, seems to just be another game that you can breeze through, and while there is nothing wrong with that, I would like to see a return to the series roots. For now, I'm also going to have to pass on the game but may pick it up later if it goes on sale. At least Kirby Star Allies has an award-winning soundtrack. I assume the level design in Yoshi's Crafted World is much stronger but I'd have to buy it to say that definitively.